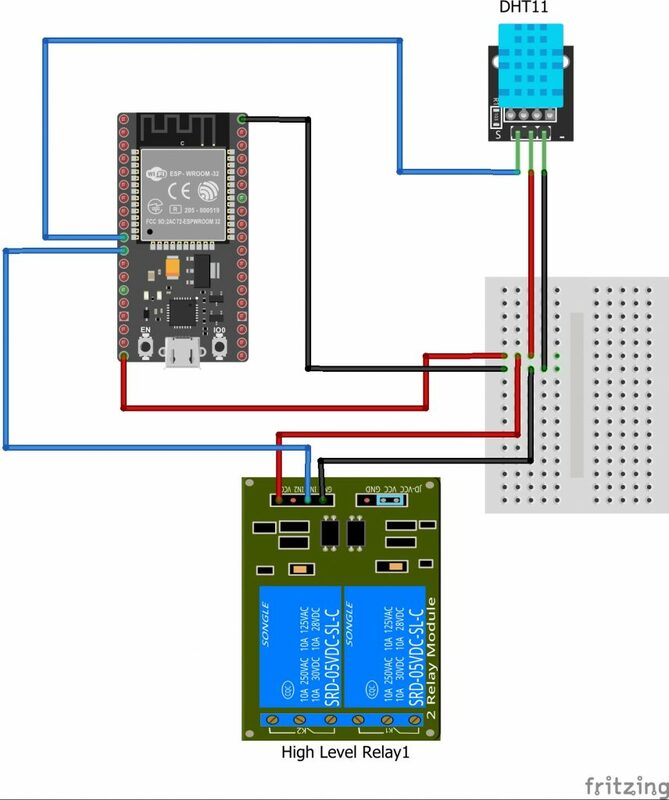 In this article you will learn how to setup the remote nodes for your Wifi Smart Thermostat, including the wiring of the sensor and the relay to the ESP32 board, and how to upload the sketch with the Arduino IDE. How to upload the sketch to the ESP32. Diagram for the hybrid node. We call this node an “hybrid node”, because it controls both things: the temperature sensor, and the relay. You could use this node to replace the classical thermostat that you have on the wall in your living room. Normally those thermostat are connected with the boiler. You have to connect the wires that go to the boiler with the relay. 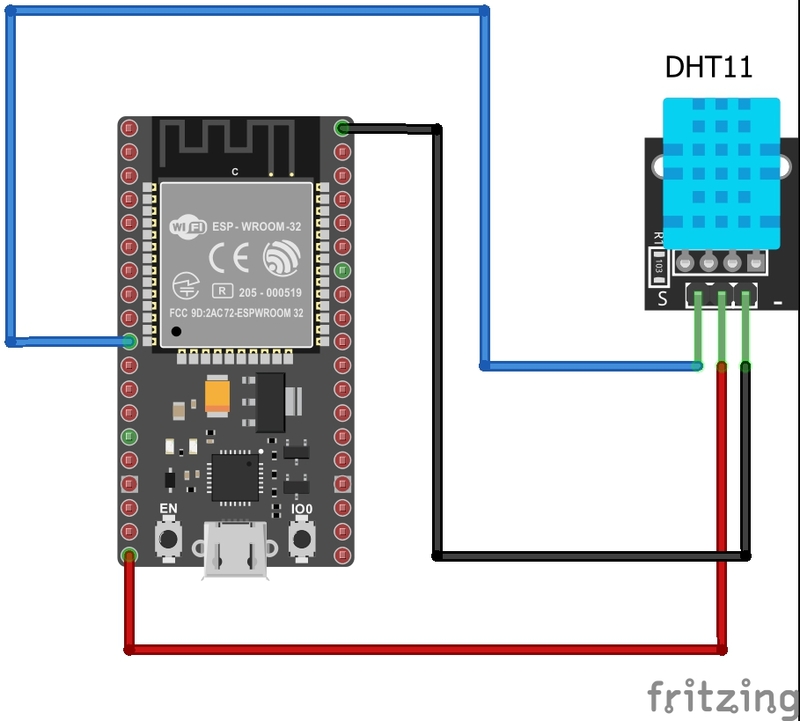 A DHT11 Temperature and humidity sensor connected to an ESP32 microcontroller . You can place this node in your main room at home. Two Channel High Level Relay connected to an ESP32 mcu. You can place this node directly connected to the boiler. And of course, you can add as many temperature/humidity nodes as you want. But you can have only one relay per thermostat and boiler. Depending on which nodes do you need, you will have to upload a specific sketch to the ESP32. Before uploading them to the sketch, don’t forget to configure your Wifi Ssid and password, and the name for the node. There are three sketches, depending on wich type of node you are planning to assembly. You can download a zip file with all the available sketches from our resources page. The next step is to upload the appropriate sketch to the ESP32. 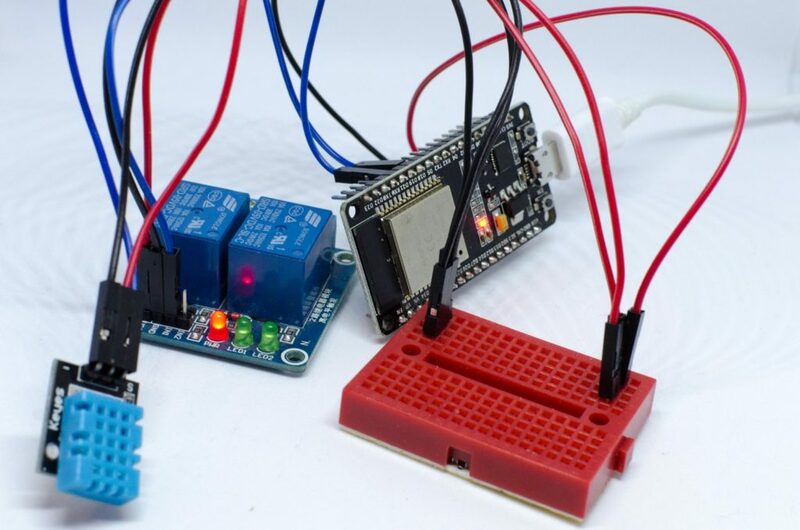 You have to decide if the ESP32 will be an temperature node, a relay node or an hybrid node, and upload the corresponding sketch using the Arduino IDE. 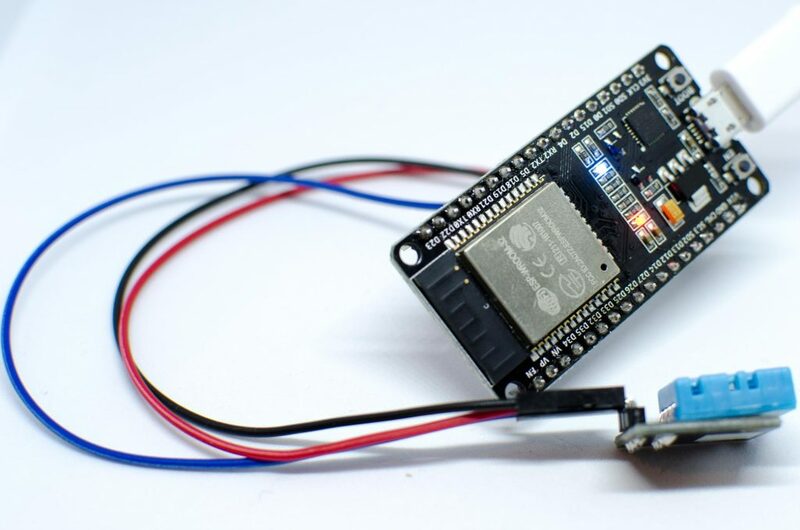 We recommend to upload the sketch to the ESP32 before connecting the relay/temperature sensor. 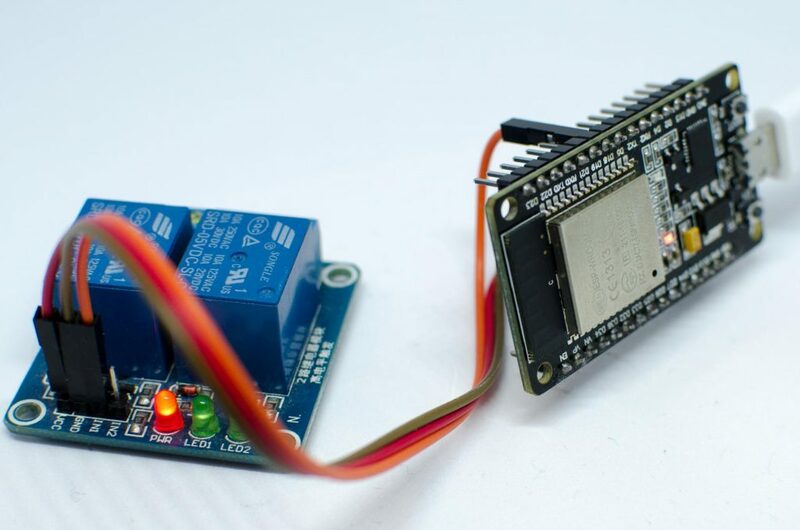 We detected problems when uploading the sketch to some ESP32 mcu’s where all the hardware was already wired, an the problems where gone when disconnecting all the peripherals. Download, install and open the Arduino IDE. You can download it from here. Start the Arduino IDE, and configure the espressif ESP32 repository: open the File enu -> Preferences. 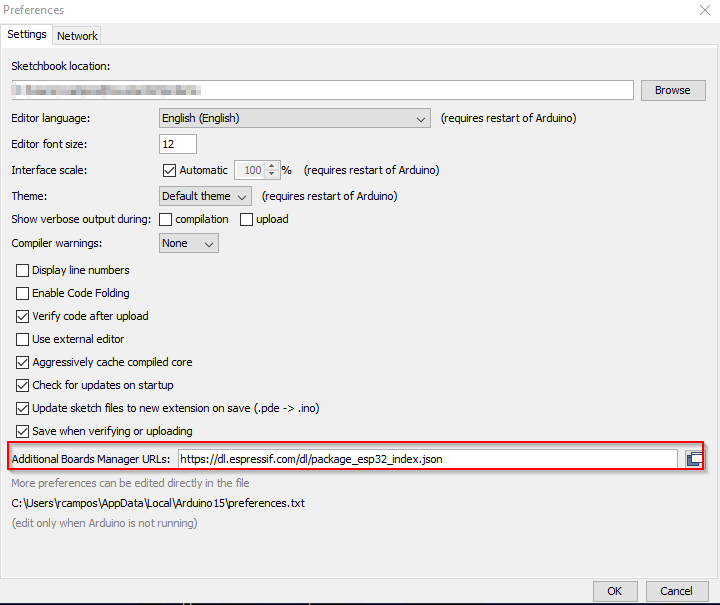 Add the url with the espressif repository in the preferences menu. Open the Tools Menu -> Board -> Boards Manager and install the esp32 platform (search for esp32). Search for ESP32 and install the esp32 platform. Select your board from the Tools -> Board menu. For example, select the ESP32 Dev Module from the boards menu. Now, install the DHTesp library, if it is not already installed. Open the Library Manager under Tools -> Library Manager and search for “dhtesp”. Install the library “DHT Sensor Library for ESPx by beege_tokio”. //Uncomment the appropriate type for your DHT Sensor. Connect the ESP32 board with an usb cable to your computer. 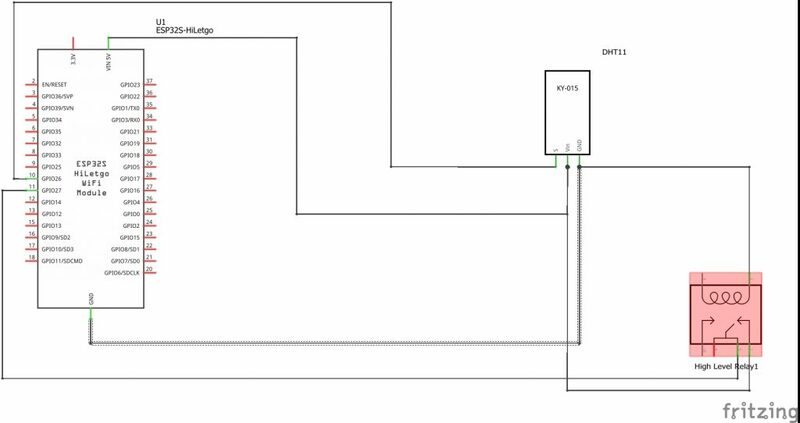 If having problems uploading the sketch to the ESP32, make sure that the cable you are using is in good condition, and is connected to a port in your computer that provides enough electrical supply. We have realized that using usb hubs, and cheap cables, does not work well. Connect the esp32 with a good usb cable to a good port in your computer. Make sure that you have selected the right COM port under Tools->COM. You can double check what port the ESP32 is using by disconnecting the mcu, looking in this menu, and connecting it again, and checking which port appears. Open a Serial Monitor under Tools->Serial Monitor, and select 115200 baud as speed. Sketch uses 619398 bytes (47%) of program storage space. Maximum is 1310720 bytes. Global variables use 41656 bytes (12%) of dynamic memory, leaving 286024 bytes for local variables. Maximum is 327680 bytes. As you see, the IP address of the node is listed in the boot message. 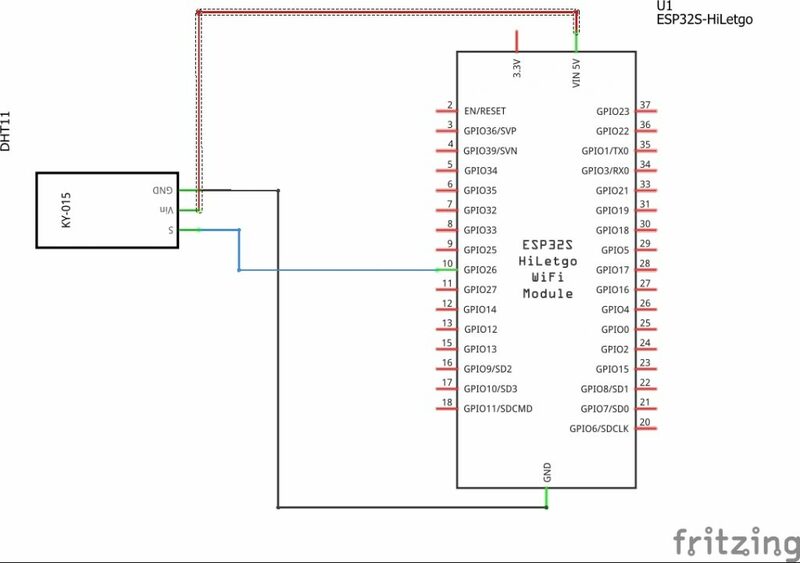 Check the sections below, to learn how to connect the relay / temperature sensor to the ESP32. 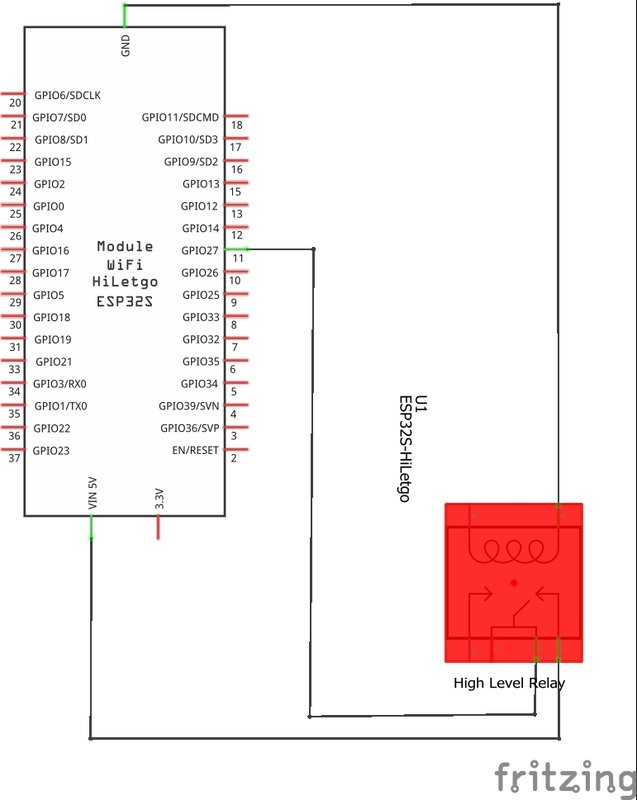 The connections from the ESP32 to the relay are the following. And of course, you have to connect the relay to the boiler. 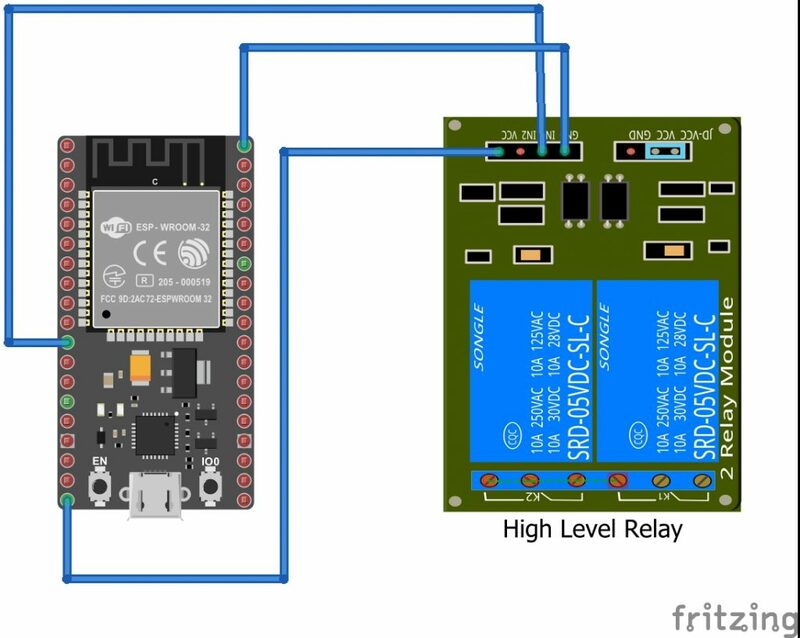 Please connect the relay to the boiler in a way that if the ESP32 is turned off, the boiler is turned off too. Normally you have to use the NO (normally open) connector of the relay. And please, always stay safe when working with the relay and the boiler. Regarding the relay, the steps are the same as for the “relay only” sketch (see above). Again, remember to take the appropriate precautions when manipulating the relay and your boiler. You have to share the VIN and GND pins with the relay and the sensor. You can achieve this using a breadboard. Don’t hesitate to visit our forum if you have questions or problems setting up your remote nodes.